The outlet of a small Fevikwik tube is hard to re-open as it easily gets stuck due to strong adhesive. 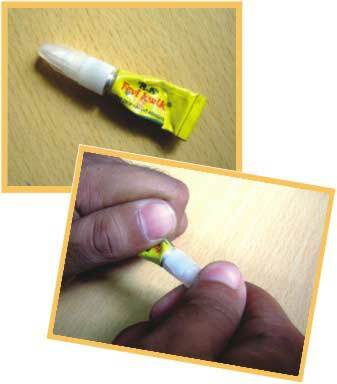 After one or two uses, the outlet of small Fevikwik tubes gets blocked due to strong gumming action of the oozing adhesive inside the closure and becomes hard to re-open. The cap of the tube is also difficult to fit into the tube after one or two uses and the adhesive gets in touch with air and dries off. While trying to re-open the tube, the adhesive may jet out in quantity more than what is required, thus wasting the adhesive. I Think we are getting the fewikwik duplicate products in ritchie street. When we open the sample pack there is no even a single drop inside the tube, We the consumers are very much dissappointed by this product. please check & verify.